Power Pak & EBS Systems! The IoT (Internet of Things) allows the Power Pak off-grid system to make a cottage a smart home. The EBS (emergency back-up system) with the loT informs the user what is happening. 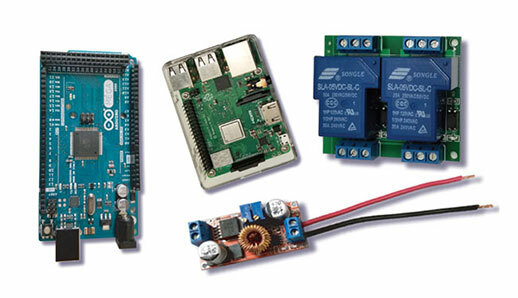 This IoT system is installable into any Power Pak system or custom design project. Ability to control 2 receptables on the Power Pak or EBS (emergency back-up system). Provides AC & DC measurements from your off-grid system. Provides power consumption data for what was used on a weekend or month. Provides indoor temperature readings in the building. Can be controlled by the on-site HMI display. Can be controlled by a phone app. With an Android or Apple app, the homeowner can communicate with the IoT device. The IoT can turn on or off lights or multiple appliances. The IoT will call your phone should an alarm be triggered on your Power Pak or EBS unit. Access the app or the webpage on your device to inquire about the specifics i.e. battery voltage, solar power, temperature etc. Use the IoT to turn lights on before your arrival. Start your furnace ahead of time to warm up the cottage. The IoT in the EBS will also call your phone when the power goes down. 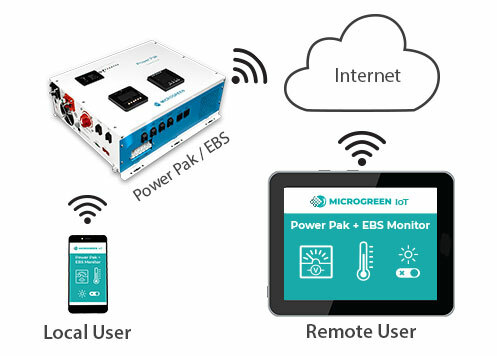 The IoT can be installed into any Power Pak. It measures different points inside the Power Pak and displays them on the local HMI display or our dedicated webpage. Simply load the app and start communicating with your cottage or home. There must be a Wi-Fi network at your cottage to communicate to the IoT. The loT is extremely easy to setup. Once you activate your app, you will recieve data within seconds.